Film Riot is a how-to trip through filmmaking from the hyper-active mind of Ryan Connolly. From how to make great effects to following Triune Films through production, Film Riot explores the art of filmmaking in a way you’ve never seen. Indy Mogul is the network dedicated to film fanatics and aspiring auteurs alike. Our shows are focused on DIY filmmaking, cheap special effects, movie reviews and conversations with high profile filmmakers and special guests. Send us your comments and requests, submit your films, and become an Indy Mogul. Drawn to podcasting in its early days, David thought of doing a show based on his trials and tribulations as a filmmaker. 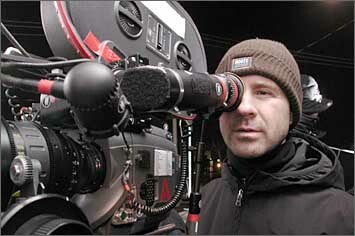 His feast and famine experiences have fueled the success of Filmmaking Central. What started out as a “for fun” project has exploded with Filmmaking Central’s listing on iTunes and consistently being in the top 50 of more than 27,000 podcasts at PodcastAlley.com. The good news is Dave (call him Dave) loves his new found job and enjoys helping fellow filmmakers, reviewing products and interviewing great people. A weekly in-depth conversation with digital filmmakers covering topics related to pre-production, production and post. We talk workflows, HD, 3D, Stereography, Final Cut, Avid, Compositing, plus much more! All of our guests are presenters from our digital filmmaking webinars. The Documentary Blog Podcast is a new bi-weekly podcast discussing non-fiction filmmaking in all its forms. Hosts Jay Cheel and Josh Ligairi will be joined by a guest each week to talk about the latest in documentary news, reviews, trailers and DVD/Blu-ray releases.